Make Kentucky’s roads a safe place to be, and join Kentucky Farm Bureau in driving distraction-free. Today, nine out of 10 Americans you pass on the road own a cellphone. And despite knowing the risk, a study done by AT&T shows that about 70 percent of those cellphone owners report using them while driving. 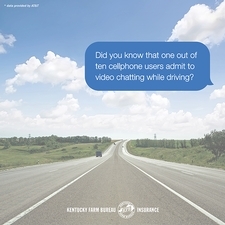 Though still underreported, cellphone usage behind the wheel continues to be an on-the-rise issue. 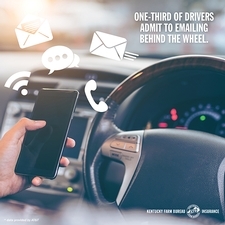 Drivers observed in a 2018 roadside survey were 57 percent more likely to be manipulating a cellphone than drivers in a 2014 survey, according to the Insurance Institute for Highway Safety (IIHS). The auto industry has taken notice. Some tools have already been invented to curb the effects of this rampant roadway issue, while other technologies are quickly developing from budding ideas to larger-than-life innovations. 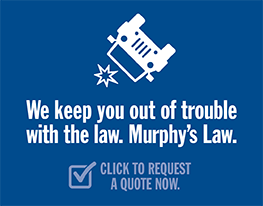 According to the Insurance Institute for Highway Safety (IIHS), many drivers involved in rear-end crashes either do not apply their brakes at all or don’t apply them enough. IIHS reports that AEB technology can reduce injury claims by as much as 35 percent – it’s essentially like another set of eyes on the roadway. Sensors on your car (cameras, radars and lasers) scan the road ahead for obstacles. If an imminent crash is detected, the system alerts the driver and begins automatically braking to reduce the severity of or prevent the collision. Those 20 automakers, which include Honda, GM, Ford and Toyota, represent more than 99 percent of the U.S.’ new-car market. According to a March 2019 report by IIHS, half of these automakers are already making great strides toward this goal. The 10 manufacturers include many high-volume automakers such as Honda, Nissan and Toyota. Three manufacturers — Mercedes-Benz, Tesla and Volvo — report 93 percent or higher conformance with the voluntary commitment, with Tesla at 100 percent. 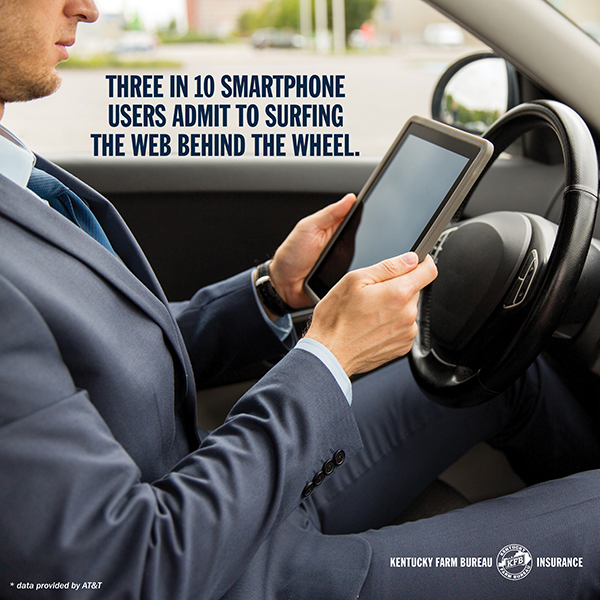 Like AEB, LDW can pick up the slack for a distracted driver. Say you’re reaching into the passenger seat for a bite of that drive-thru cheeseburger you just picked up and temporarily take your eyes off the road... LDW alerts drivers with an audio or visual alert when they unintentionally drift out of a lane without a turn signal on. While LDW leaves the correction up to the driver, LKS goes a step further by taking action. If sensors detect that a car is about to unintentionally move out of its lane, LKS will correct the steering and return the vehicle to its intended path. If you thought automatically-braking cars were space-age, imagine a world where cars were able to monitor your eyes and tell if you weren’t paying enough attention to the road. Well, that technology may not be too far off. While it is still being developed, some car manufacturers are experimenting with eye-tracking technology that would detect when a driver’s gaze has shifted and send alerts to regain said driver’s attention. In March 2019, popular automaker Volvo announced a plan to equip new vehicles with interior-facing cameras designed to monitor a driver's attentiveness by tracking their eye movement. If the cameras were to detect that a driver is distracted by looking at their smartphone or not keeping their hands on the steering wheel, it would raise an alarm. The automaker pledged to make this technology standard on every single Volvo starting in the early 2020s. While self-driving cars and innovative gadgets are sure to help our growing compulsion with smartphones, they alone can’t eradicate the problem. Make Kentucky’s roads a safe place to be, and join Kentucky Farm Bureau in driving distraction-free. >> In Kentucky, there’s so much to live for. Join us in driving distraction-free. To learn more about distracted driving’s prevalence in the Bluegrass State, click here.